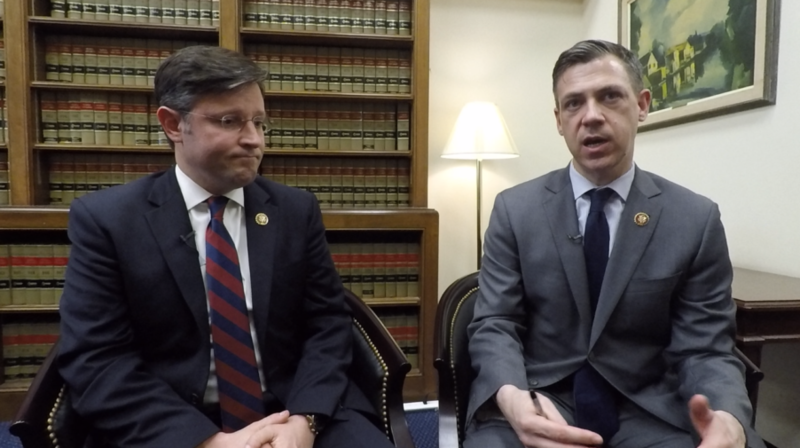 Left to Right: Rep. Mike Johnson, R-La., and Rep. Jim Banks, R-Ind. Heritage Spokesperson Genevieve Wood sat down with Rep. Mike Johnson, R-La., chairman of the Republican Study Committee (RSC), and Rep. Jim Banks, R-Ind., chairman of the RSC Budget and Spending Task Force, for a conversation about spending, the debt, and why it’s time to take these issues seriously. As a conservative caucus of the House Republicans, the RSC exists to bring like-minded House members together to promote a legislative agenda that will limit government, strengthen national defense, boost America’s economy, preserve traditional values, and balance the budget. The RSC intends to release a budget proposal in May. Listen to the full interview on The Daily Signal Podcast here. How would you advise members of Congress to reduce spending and balance the budget? They should pay attention to Heritage’s Blueprint for Reorganization from November 2017. Also, there are other groups that put out waste lists and lists of boondoggle research projects like ‘Shrimp on a treadmill’. ‘Bringing Home the Bacon’ is an idea that must be ended. Citizens Against Gov’t Waste has an extensive list of wasteful programs financed by the Federal Government. Each department should be tasked with eliminating their budget lines. Some are ongoing, without a sunset. There are many for the unemployed, ridiculous studies by scholastic institutions. Too bad there is no line-item veto by the President. I paid for my Social Security. Don’t like it called a govt. Expenditure. Make it independent and keep Congress’ hands off it. Any private retirement plane would be paying me a multiple of what the SS system pays. the answer is to establish a central online location where the American people can send in their contact with the government where the government is wasting money or effort to no avail. invite the govt employees to anonymously notify where several departments are doing the same thing etc. this would quickly identify the $900 screwdrivers in every department, and the three departments to screw in a light bulb tasks. Also, there is a statute that automatically annually increases the budget for each government department. delete that statute. We need to look at programs that can be administered by states and run more efficiently there. These programs should be moved out of D.C. to states where they can be run at lower cost and without paying so many unproductive bureaucrats. A good example is the Transportation Empowerment Act that would move 14 cents of the 18-cent gas tax back to the states where it was collected in the form of block grants over 5 years. At the end of that time, the state gets the 14 cents and uses it for roads, bridges, etc, without all the rules the feds require before this money can be used to build things. Over the long run, this restores federalism and saves money. This model could be used for many federal programs, and the bureaucracies in D.C. could be downsized. Congress should listen to you and other likeminded organizations that do not have to worry about being re-elected. Take the politics out of it and operate it a business. I have seen this done in business and it works. Cut all expenditures by 10% in the first year and 5% every year after that. Everyone has to prioritize better the money they have. If the liberals want to spend money we don’t have, increase their taxes to make up the surplus. Do away with retirement programs for all politicians. It is ludicrous and in dyer need of revamping. If u want to spend more money, give more money!!!!! Just don’t mess with Social Security and Medicare. That is our money we were required by law to provide us in our old age. You have already stole our funds decades back when it was taken to prop us the general fund. Because Congress didn’t have the moral thing to do, here we are still in a mess. It looks like we need term limits to get these sorry people out of government. If you had not burdened us with outlandish benefits, maybe we wouldn’t be in this mess!! Simple. Start running the government by God’s economic plan. Live within your means, save for a rainy day, and pay a full and honest tithe (10% to charity, your church, or something and someone outside yourself.) We do not need a full time legislature. The democratic-republican form of government requires citizen servants not a political aristocracy. This is our fault because we have failed in our diligence and responsibility. Start by removing anyone on Social Security that has not paid into it for 40 quarters. If they have not paid in then any payment to them is welfare. Put the right label on the problem and then fix it. Continuously vet all recipients of gov’t programs to insure they are eligible for benefits. Punish violators. Freeze expenditures for all non-essential gov’t programs at current levels. Cut all funding to the UN. The UN is undermining our immigration efforts by assisting caravans to come here illegally. Close down the departments of energy, education, and commerce. They are not needed. Impose work requirements for all forms of welfare hand outs for the capable. The government should probably levy the social security tax on all earned income, and eliminate the cut-off point of around $120,000 per annum. This would enable the government to help reduce the social security debt. It’s also fair, as folks who earn less than the cut-off must subject their full income to the social security tax while those making more experience a gain. An easy start would be to start using technology and data to weed out fraudulent payments for Social Security, Food Stamps and all other entitlement programs. All you need to do is use Open The Books findings to clamp down on rampantly overboard pensions, benefits and Pork Barrel/BS spending on meaningless projects and funding of colleges that don’t need money or are not performing well enough to warrant grants. I am amazed that our lawmakers need guidance to reduce spending, surely they know what is going on and need to stop it immediately. I resent that Social Security is considered an expense. FICA is collected expressly for that. Politicians buying votes gave coverage to many who didn’t contribute, thereby squandering the assets. All other government funds are squandered by inept politicians and managers who are not accountable. Until those positions are filled by qualified people, there is no way to collect enough money to cover all the liberal dreams. Our system of government is doomed. Let’s go back to our Constitution. Our government needs to be limited. That’s what the Founders intended. Why not chart a process and procedure to bring us back to truly limited government in the next ten years? Hey, what if the national debt were to be paid off?! What if the Dollar were returned to a currency backed by gold?! What if it were an impeachable offense to spend more than the taxes collected every year?! What if term limits were enforced on ALL members of Congress?! Reps get 3 terms, Senators get 2 terms. We’d end up with a government composed of citizens and the idea of professional politicians would be consigned to the dust bin of history! What if we dared to claim for ourselves and our future generations a government that promoted liberty, personal responsibility and the freedom to fail or succeed? Our Founders got it right, let’s get back to what they envisioned for our country. Get Educated on Natural Health Care. This will vastly improve the health of all and save super Mega Dollars from the budget. When the Pilgrims landed at Plymouth Rock, they brought with them a medical system based on power, authority and greed. It only has gotten worse. Spend some time reading Mercola.com and talk with Joe Mercola, he would like to help. Quit the life time salaries off all Congressional members. Pay into SS not special retirement and all Congressional members be under same healthcare plan as Americans have to choose from. Quit giving everything free to illegals coming into the country. Have a work problem for them. Spend only what the government is ment to spend to fulfill its obligations to its citizens as defined by our constitution..
1. Move to reduce and eliminate duplication and waste in federal programs and spending. Defund programs and grants which should not be taxpayer expenses, such as funding a radio program (NPR) and Planned Parenthood. Look at the CAGW “Pig Book.” 2. Gradually increase the Social Security full retirement age from 66 to 70. 3. Increase the federal gasoline tax. 4. Cut “foreign aid.” What do we think we are doing? Paying corrupt dictators? Trying to buy friendship? Keep our money home. 5. Cut domestic subsidies, starting with farm subsidies and subsidies to electric vehicles and alternative energy companies. Every department of government must reduce their cost/budget by 10% every year until the debt is under controlled! No exceptions!! Cut every department except the military 5%. Every single one of them. Every Dept has at least 5% of waste. Just do it. Then next year do it again and again until the budget is balanced. It’s as simple as that. NO GOVERNMENT BENEFITS must ever be given to illegal immigrants (criminal aliens). Get them out of our country! The RSC and all Republicans should start by explaining our fiscal problem to the citizens in this way: WE have $22 trillion in debt, $100 additional trillion in unfunded liabilities in Social Security, Medicare, Medicaid, and other pensions, and our entire private wealth is around $97 trillion. So, confiscating our entire private wealth will not solve the problem and our children and grandchildren will suffer the consequences. Therefore, we must reform SS, Medicare, Medicaid, and other government pensions. The first step is to eliminate the ERISA exemption of government pensions from ERISA’s financial requirements of all private employer pensions. Social Security should then be placed on a career average earnings formula replacing the current final average earnings formula without any adjustments for wage or price inflation during the benefit accumulation period. Next, limit covered compensation to a maximum of $100,000 per annum for FICA tax and benefit calculation purposes. Next, there should be NO consideration of any “Medicare for All” proposal before Medicare’s current funding shortfall is openly debated and successfully addressed! Current Medicare beneficiaries pay $1,626 in annual “premiums” for 2019 if their current annual earnings are less than $85,000 if single and $170,000 if joint tax filers while the average Medicare claim cost per covered person is over $12,000 per year! The benefit formula and contributions must be adjusted, medical malpractice judgements must be limited, medical fraud must be addressed, and medical quality controls must be instituted by a non-government quality control committee of medical professionals (not a death panel of medical ration bureaucrats)! The federal budget should be treated like a business budget. The budget should not have any discretionary spending, and money not needed at the end of the year should not be spent! Not even for the wall that we desperately need. Emergency money should be specifically voted on to go over budget if needed. College educations are footed by the tax payers, and if their children are employed by the federal gov’t, their subordinates’ children also get a free ride to college!. They pass legislation that their constituents have to live with, while exempting themselves. And gov’t funded programs have automatic funding increases built into them. Ronald Reagan was so right, “There’s nothing quite like eternal life as a gov’t program.” Time to sunset the useless ones or those whose purpose is duplicated by another gov’t program, or worse yet, those whose purposes conflict with others, yet both are subsidized (such as programs to help people quit smoking, while subsidizing the tobacco industry!) Gov’t is too big and overreaching, making decisions “for our own good” that, as citizens of a free nation, we are quite capable of making or not making for ourselves. Enough with the Nanny state! That would be a good start toward fiscal restraint. We are in too many countries and we should be less global in our approach. We would save money there. Revisiting those on SS Disability to see if they really need it. Cut out foreign aid and moneys given to worthless causes. #1 Make Secretary DeVos’ main job to dismantle the Dept. Of Education. According to the US Constitution Federal Govt is responsible for Article 1, Sec. 8 – regulate commerce, power to coin money, to declare War, to raise and maintain Armed Forces, and to establish a Post Office. Instead it has over reached and is intruding in areas that it should not be involved. NIV & negative amortization Mortgage. I can provide strong the base of this suggestion. These steps will raise activity in convention field up to 40% & up to 80% in “”Jumbo” field. with no extra risks for lenders. Have all the congresspersons get their congressional checks and put them in the SSA, do not TAX the SSA distribution, and go back to whatever with a smile on their faces. GOD bless ! Simply freeze the Federal budget for ALL categories of spending at levels of the most recently Approved Budget (NOT Continuing Resolution). No sacred departments. Let’s simply begin with No Spending Increases until Federal Debt, as a percent of GDP, is reduced by 50% from current levels. Of course this strong medicine won’t happen. The result will unfortunately be a “Debt Reset” across the board because debt is past the point of no return. Sorry to be such a negative Nellie – hope I’m wrong. Social Security and Medicare aren’t budgeted expeditures, and therefore not in budget deliberations. How then, does government throttle back expenditures and resulting debt? Welfare and food stamps must have a work requirement. Illegal/undocumented immigrants should not be eligible. There should be at least a one year waiting period for people moving into the city/town/village in order to apply. Take a sharp pencil to the Department of Education and cut it 10 % every year for five years. I have other thoughts but will pass them on later. Zero out all foreign aid and then re-evaluate each situation on a case-by-case basis. No foreign aid should be given to governments that consistently slander the U.S. or are actively involved in giving aid support to enemies of the U.S.
1. Cut the Federal workforce (bureaucracy) by 10% in every department. 2. Eliminate the Departments of Education, Energy, and Labor. 3. Eliminate the retirement program for all elected officials and let them use the same social security program that we do. 4. Challenge the right of federal employees to unionize and don’t negotiate salaries & benefits. 1) Freeze all federal spending at 2019 levels; no increase and no cuts until we have a balanced budget. 2) Set congressional wages at minimum wage until budget is balanced, and eliminate all benefits. 3) Limit each member of Congress to no more than 4 aides. 2 Put term limits on the house of reps.
3 Turn health care and welfare to the states. 4 Read George Washington’s and Ike Eisenhouer’s farewell address in CONgress every day until things change. Suggest to the President that he rescind executive orders that created Affirmative Action which, by its mere presence, suggests that minorities need government help to succeed in life. This is racist because they don’t need help. This would eliminate the administrative bureaucracy that oversees this massive program. We need to stop giving so much money away to foreign aid, abortions, prisons, welfare, and climate change. The citizins of america can help foreigners in need through donations by choice. Abortion is just plain wrong. Prisons are made to comfortable for people now, prisoners should pay their own way like they used to whether or not they press license plates or work fixing roads or something new. To much welfare if paid out to illegal immigrants and perfectly healthy citizens that are just lazy. Stop worrying about climate change and trying to fix something that don’t exsist. We all learned a song as children He’s got the whole world in hands….I can’t think of anything more true. We can’t change the climate anymore than we can predict how old we’ll live to be. But really most of all I can’t stand how much of tax payers money is being given to illegals and foreign aid when we have so many disabled veterans being denied finacial help. I think the majority of tax payers would agree with me, I hope you do to. Move SS eligibility two years out (age 69 for full eligibility) and at the same time make all SS disbursements tax free (since SS tax is not deductible from FIT). Work to dissolve the Federal Reserve. Return the dollar to a “intrinsic value” based currency. I applaud the budget work of the Republican Study Committee. Their effort will be instrumental in regaining conservative majorities in House and Senate. The nation’s well-being depends on achieving a balanced budget. In balancing the budget, please include significant, steady, and carefully-planned reductions of all executive departments and programs not required of the federal government by the Constitution. We need to deeply cut Federal money going into education. Too many schools have become indoctrination centers, and they have, and continue to undermine the values on which this nation was founded. Schools should be funded locally, not with Federal money. If universities received no Federal funds, they might channel some of their brain power into figuring out how to get by with less, and how to survive in a competitive real world. Can’t health insurance be used more effectively to reduce Medicaid? What are the requirements necessary to get Medicaid? Seems to me that it’s a “free-for-all” type of organization. The trouble is that citizenship does not count for anything anymore. Illegal immigrants get a lot more benefits than any citizen. It is a poor sign of government control when the Census cannot even ask if you are a citizen. If a defense group were to form for citizen’s rights, I would be the first to join. The whole area of debt and entitlements are monstrously dangerous and getting beyond ability to rein in. If some fiscal prudence is not employed soon, we will have gone perhaps too far to backtrack. We need to freeze any pay raises that Congress votes themselves and eliminate Gov’t waste!! Spending & Deficit are out of control.! Cut Spending! Make a law that ALL bills must have ONE topic and no spending can be added that is unrelated!!! This should stop “PORK”!!! Make it a LAW! Every year almost every government agency expand their mandate in order to raise their budgets. Do NOT allow this!!!!!! This year make them go back to their original mandate. The CENSUS Bureau is the worse by adding surveys and questionnaires every year and staff to take them!!! Get rid of everything in the Budget that encourages people to NOT work and everything in the budget that discourages people to work. Continuing Resolution spending must stop! Every agency must submit a 5% spending reduction budget every year until the budget is balanced. Social Security must be grandfathered for all workers with 20 years of contributions. Freeze Federal employment at current level and reduce 5% every year until budget is balanced. There must be a yearly audit to stop unauthorized and fraudulent spending. Line item veto on budget. Have all of congress pay for their own healthcare. No salary for the rest of their lives with healthcare included in same. Get rid of the “pork belly” programs. Bring back line item veto. Limit terms. Do away with lobbyists and special laws for them. Do something about the defense spending industrial complex. Free market their. No more $20k toilet seats….No more ridiculous funding of asinine research for the colleges and universities who could care less about teaching students (or the laws/constitution)….. ad nauseum. Follow the recommendations of both “Citizens Against Government Waste” and the Heritage organization to reduce federal expenditures. Have each congressional member state publicly that they promise to vote to reduce the federal budget deficit by $3 trillion by the end of FY 2025. If they choose not to and/or fail to keep their promise, they should be made to resign their respective positions. The respective party leaders must agree to this or forfeit their positions. Publish names, votes and expenditure reduction progress widely. I am impressed with many of the responses on this topic. Fancy, elaborate programs put together by high minded outfits like Heritage are almost certainly doomed to failure for the simple reason that Democrats can block them, with the press’ help. The problem we have now is no accountability. Demanding that the government as a whole balance their budget is worse than useless, everyone will blame others for the problem. When everyone is to blame, no one is to blame. We need to figure out a way to hold departments accountable. Give each department one year to get in balance. All departments found not in budget would be punished. The top layer of management fired and banned from working for the government forever and all grants and or subsidies distributed from that department eliminated until it can find a way to stay in budget. Make sure all Americans know how much $ we send each yr to so many countries listing countries and $ amounts, then stop paying. (They mostly vote against us at the U.N. Defund Planned Parenthood. ( am made a murderer by their use of my taxes.) Get out of the U.N. and get them out of the USA. Put all government workers – ALL – into Social Secutity taking them off their magnificent retirement plan. Term limits which will also reduce their pensions. Build the wall so we don’t have to house, feed, educate and provide medical care to illegals, who will be made instant voters. When did “serving” become a “profession”? Cut out all the perks and the swamp will be drained. It will not be so lucretive to go to Washington. Spending will be drastically reduced and a budget balanced. Two-thirds of the Federal budget is fixed, (SS & Entitlement Programs) We need to work on the BIG number. Increase SS retirement age for ALL immigrants & people under 55 yrs of age to age 70. Permit Health Insurance companies to compete, across state lines. Identify and eliminate duplicative Federal agencies. Reduce spending by 1% annually. Require Congress to be subject to the same healthcare system mandated to their employers. Demand accountability. Pair spending with results. Don’t double count results. Zero based budgeting. Actually have budget that must adhere to. Sorry to be realistic after seeing all the thoughtful comments. You cut the budget by doing what people all over this country have been doing for a long time. You prioritize. Allot funds for the absolute necessities and then start cutting from there. We all know that there is too much waste in the government. Obviously, politicians never heard of budgets. There was a time when we didn’t have one nickel left over after we paid bills. It’s time the gov’t does the same. Please don’t vote to increase salaries of elected members of the House of Representatives or the Senate. Then 5 persent for 5 years. Term limits for both house&senate start with most senior members as they run out their terms. Let banks take over student loans. Cut federal department of education , let states control their education system. Quite simply, get back to basics. Authorize spending only on those items Constitutionally authorized. Send everything else back to the states to decide. I realize this currently is a conservative’s pipe dream, but we MUST take what steps are necessary to wean the people off the Federal Government’s money trough if we are going to survive as a nation. STOP giving illegal immigrants medicare/medicade, social security, food stamps and so on. Revert to previous requirements that immigrants MUST have a sponsor so they will not need these welfare programs. Secure our southern border and stop the flood of illegals destroying our republic! Notice I did NOT say democracy! Go to zero based budgeting and make every department justify its existence. Eliminate obsolete departments and programs. Stop subsidies for ETHANOL!! Totally eliminate payments ti the United Nations. 1. Citizens Against Govt Waste is a good start. 2. Eliminate the Dept of Education-over 40 yrs of waste and interference in state programs..
3. Seek other functions that can/should go to the states, no longer federal. Remove all the overlapping and redundant bureaucratic agencies ‘we don’t have a revenue problem, we have a spending problem’. Eliminating or restructuring entitlement programs wouldn’t be bad either. First, I thought that with greater employment, expenditures on entitlement programs would diminish??? End end of year spending to make sure all money is spent. body is impossible and will bankrupt our nation. Start cutting all programs by 10% each year and don’t stop until we have a balanced budget. Also require all Senators and congressman to fire half their staffs. Make it mandatory, in the annual budget, to include a 10% reduction in the national debt and, when it is retired, require all future budgets to be balanced. This may require a constitutional amendment. All Americans should do all that they can do to support President Donald Trumps’ re-election. cut congress salary, pension, and health care. They all have enough money they could all give half of what they have to pay off the debt. Limit the amount everyone running for office except for the president office to $100,000 and none can use any of their own money. The rest of the money they would have used could be used to pay off the debt. No benefits to refugees, or illegals. Quit sending our money to our enemies. Stop sending any money to the United Nation. No more money for Planned Parenthood. No more of our social security to refugees or illegals and their children in Mexico. No more free airfair or free ride on military planes like Pelosi does all the time. for congress or congress traveling to other countries. stop all security for past Presidents after two years. We don’t need to have the FBI around them for 30 years or so. No one care about them after a few years. I have heard this about the military: departments, for their next payperiod, list items to be financed in order to get the same funds allotted, even if in reality they don’t need all the items listed. (Someone may correct me if I’m wrong here.) My friend in Heidelberg, Germany, told me,that they erected new fencing around some military facility while it was known the facility would be shut down in short time. This was some years ago. Also, a friend who works here in Quantico, knows of a collegue who wasted 50 million dollars for useless programs, and is still wasting. He had been removed from a previous position because of problematic things he did. As happens in corporate America, institute an across-the-board budget reduction of say 5%. Each and every government agency will have 5% less to spend, no exceptions! Belt tightening and other cost-cutting initiatives will be implemented by agency leadership. Periodic benchmark reporting should be disclosed to the public.